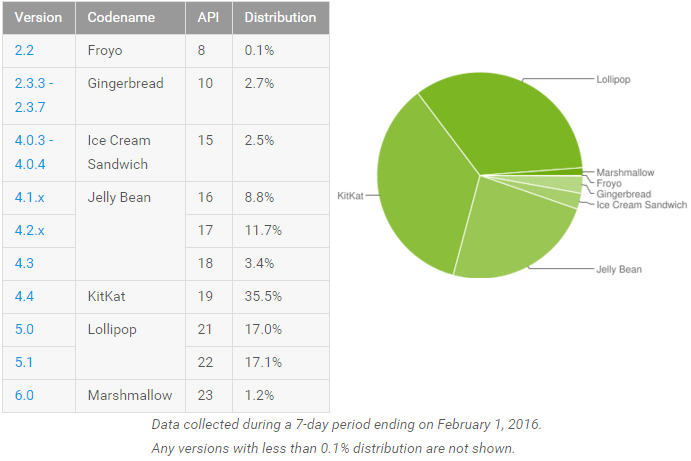 Android 6.0 Marshmallow which was released almost four months ago has now captured more than 1 percent share in the Android Distribution chart. 1.2 percent to be accurate. The developer preview for Marshmallow was released last year in May during the Google I/O event. It was unveiled in September 2015 during the launch of Nexus 5X, Nexus 6P and the Pixel C tablet and was made available later next month. As of now, Android 4.4 KitKat is leading the chart with a total share of 35.5% which is followed by Android Lollipop with a share of 34.1% and Android Jelly Bean with 23.9%. These versions of Android are then followed by Gingerbread with 2.7%, Ice Cream Sandwich with 2.5%, Marshmallow with 1.2%, and, Froyo with 0.1%. Froyo is sitting with 0.1% and we can expect it to be out of the chart when the next distribution report comes. Even after almost four months, Marshmallow is still at 1.2% which shows that OEMs aren’t much dedicated towards rolling out updates on time. 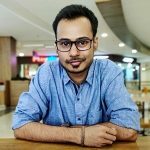 Pair this with those carrier bound smartphones which is an entire story altogether. As of now, only a handful of devices are running Android Marshmallow which include the Nexus range, the Android One devices and some smartphones from HTC and LG. Which version of Android is your smartphone running on? Has your device received the Android Marshmallow update yet?